A Pathfinder Society Scenario designed for levels 1–5 (subtiers 1-2 and 4-5). ►Click here for more details of playing Pathfinder Society at FG CON 10! The Pathfinder Society has discovered the location of a powerful Osirian artifact secreted beneath the sands, but they are not the only ones who seek its power. The Pathfinders must endure the scalding Osirian desert, brave its inhabitants, and watch for hidden dangers if they are to survive. Can the PCs reach the ruins before their rivals claim the prize? 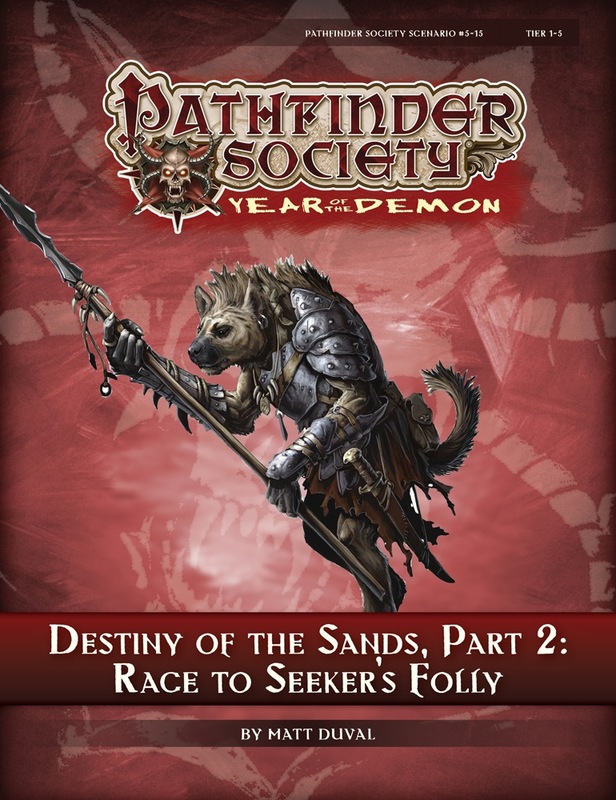 “Race to Seeker’s Folly” is the second scenario in the three-part Destiny of the Sands campaign arc. It follows Pathfinder Society Scenario #5–12: Destiny of the Sands—Part 1: “A Bitter Bargain” and is followed by Pathfinder Society Scenario #5–16: Destiny of the Sands—Part 3: “Sanctum of the Sages.” All three chapters are intended to be played in order. Written by Matt Duval, RPG Superstar 2013 finalist.